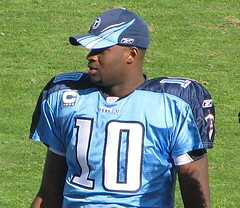 The most notable move of the week was Tennessee’s decision to put QB Vince Young on injured reserve with a right thumb injury. Of course, the transaction itself is only part of the soap-opry story going on in Nashville. Young hurt his thumb against the Redskins, and he thought he was healthy enough to be able to return to the field. But the coaching staff disagreed, opting for rookie Rusty Smith in what ended up being an overtime loss. Then, all heck broke loose, as Young openly defied head coach Jeff Fisher in the postgame locker room, and Fisher announced that Young wouldn’t be the starter, injury or not. Smith will start until Kerry Collins is healthy enough to take over, and Chris Simms returned to provide depth. The question now that Young has gone on IR is whether he will ever start for the Titans again. Young has apologized to Fisher, but the head coach has seemingly tired of Young’s rabbit ears, moodiness, and work ethic. That last item is the one that could ultimately keep Fisher from giving Young another chance. One of the big storylines of the offseason will be whether the Titans give Young another chance, and if they do, whether Fisher is part of that decision or uses that choice as an excuse to leave the Titans after a 17-year run that dates back to Houston Oiler days. Redskins (put RB Clinton Portis on injured reserve, promote RB James Davis from practice squad) – Portis has had an injury-plagued year with just 54 carries in parts of five games, and his latest injury will likely end his Redskins tenure, if not his career. Portis has had a fine career, but he has so many miles on his legs that it’s hard to see him being a major contributor going forward. With Portis down and Ryan Torain dinged up as well, the Redskins promoted James Davis, a former Brown, from the practice squad to complement Keiland Williams. Dolphins (put C Cory Procter on IR, add C Eric Ghiaciuc) – Procter is the second Dolphins’ center to be forced onto injured reserve. Ghiaciuc, who has bounced around in recent years, provides depth behind replacement Richie Incognito. Buccaneers (cut DT Ryan Sims, promote DT Frank Okam from practice squad) – The Bucs let veteran Sims, a former top-10 draft pick in Kansas City, go and promoted Okam, who has spent time with Houston and Seattle this year. Bengals (put DT Tank Johnson on IR, add CB Fred Bennett) – Johnson, who has done a nice job in his two years in Cincinnati, went on injured reserve with a knee injury. His roster spot went to Bennett, a former starter in Houston. Last August, we put together a post on 30-year-old running backs from a fantasy football perspective. We were reminded of that post Thursday morning when we read the news that the Browns had released RB Jamal Lewis. Lewis is the first of these running backs to be cut this offseason, although others on the list – most notably LaDanian Tomlinson – could end up on the chopping block as well. We’ll cross the LDT bridge when we come to it, but for today we’ll discuss Lewis’ past and future. Lewis, who ran for 2,000 yards and won a Super Bowl in Baltimore, has slowed down significantly in recent years, but he was still able to run for 500 yards and cross the 10,000-yard career mark last season.Cleveland let Lewis go to hand the ball to Jerome Harrison, who finished the season very strongly. The Browns also have James Davis returning from injury after he showed some flashes as a rookie last year. Last season was Lewis’ first campaign out of 9 in his career in which he ran for less than 900 yards, but his yards per carry average has topped 3.6 only once in the last five years. Lewis isn’t committed to retiring, but as Edgerrin James learned last year, the league starts to retire running backs before they think they’re really done.